I had to print up the galleys for HIGH MAGA, but then again, I’m old school when it comes to editing. I have a fair amount of techno savvy – more than some, less than others – but it never occurred to me until that moment there were writers in the world who no longer messed with paper. Welcome to the new millennium, Karin! Being part of a transitional generation, my writing habits have changed a lot over the years. The initial draft of my first novel, Eolyn, was written entirely by hand in journals, to be transcribed and polished on my laptop computer. 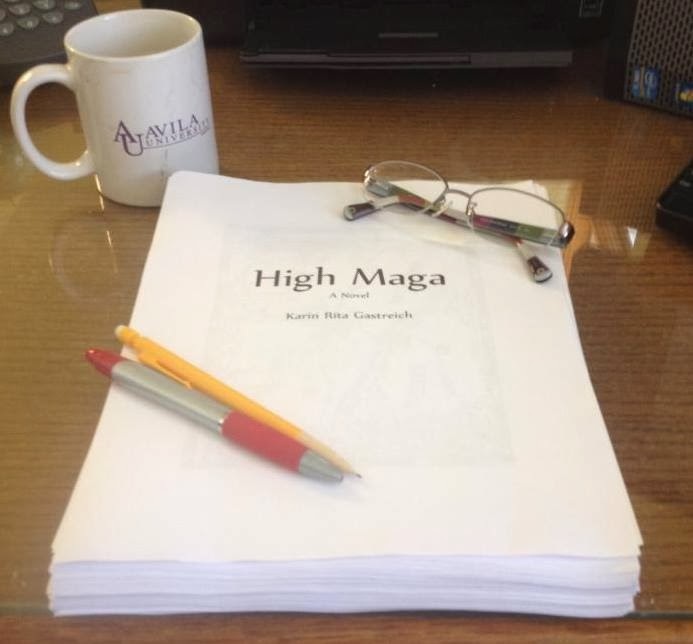 However, by the time I sat down to write High Maga, I was composing almost everything directly on the computer. I have to admit, sometimes I miss the gritty feel of pen on paper, the satisfaction of slashing through entire sections, making notes in margins, and so forth. Cut, paste, delete just doesn’t carry the same level of physical and emotional engagement in the editing process. Still, I’m also fairly certain my journal writing days are over. Whenever I sit down and try to do things again with pen and paper, the thoughts just don’t flow like they used to. Like they do now in front of the keyboard. Although most of my writing is now electronic, at some point toward the end of crafting a novel I simply must go through a print copy of my work. Maybe there’s a neuro-cognitive explanation for this somewhere, but the simple truth is there are many details that slip by me on screen that I invariably catch on paper. And I’m not just talking about missing commas or extra spaces. Sometimes major errors somehow disappear inside the on-screen text, only to jump out at me when I have the print copy in hand. And yes, with the print copy I get to return to the old joy of marking up, slashing out, making notes in the margin, and in general, feeling that scratch of pen upon paper that is somehow so fulfilling for me as a writer. So, yes, my friends of the new millennium. Paper copies of manuscripts still exist. Indeed, I couldn’t do without them. How about you? Are you a 100% on-screen editor, or do you need to print things up the old-fashioned way like me? What other tricks do you have to catch those errors that tend to melt into the background once you’ve viewed a manuscript a thousand times? And just out of curiosity, does anyone out there still use a journal? I just had this conversation with my editor this morning. There are all kinds of tricks and such within Word that I have no idea exist. They’re all there to make editing and writing easier. My response to her was that, given the option, I’d ride horseback instead of drive a car, and that I’d do all my editing hard copy if it were feasible. Like going from hand-written journals to the keyboard, I’ve learned to see as well on the screen as I do on paper. I could never go back to writing longhand for the same reason you can’t–my brain process has changed. Still, I love hard copy editing best. I do, I do.